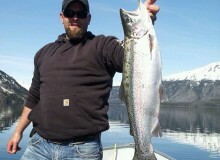 A work crew flew in to open up the lodge and had a little bit of fun catching some spring rainbows. A Fresh look for the Cabin! 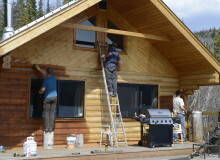 Everything is looking good out at the lodge and we are excited for the summer fishing season. There are lots of guests that are ready to fly over our beautiful northern BC mountains to the paradise that Tesla Lake offers!